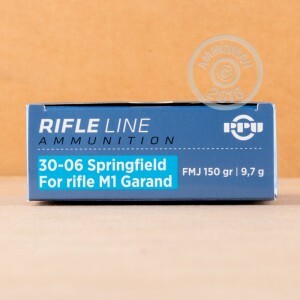 Experience shooting the M1 Garand as GIs in the 1940s did with this mil-spec .30-06 Springfield ammo from Serbian manufacturer Prvi Partizan. These cartridges replicate the dimensions, pressures, and other shooting characteristics of World War II military ammo for maximum authenticity. Unlike the real thing, however, this new production ammunition comes with a modern comfort your vintage rifle will appreciate. 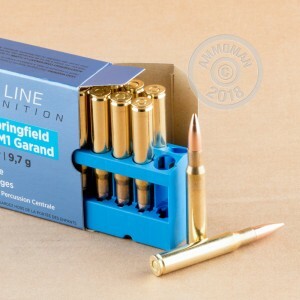 These cartridges use non-corrosive Boxer primers so you won't have to worry about scrubbing your rifle squeaky clean or damaging it. They also use brass cases suitable for reloading. This makes them a superior alternative to dodgy old surplus rounds. Grab a few of these 20-round boxes and put your M1 through its paces. AmmoMan.com provides free shipping for all orders over $99, so the more you buy, the more you'll save in the long run. Delivery was fast and the ammo sure looks good - will finish review after I get to the range. Ammo worked flawless. Will be buying more in the future. No jams, or any other issues.